We are incredibly proud to announce the production of a Kitaru videogame that will bring our characters and story years in the making to players around the world. Kitaru slams players into the war-torn world of Saph. Four factions tear society apart and it is up to players to fight enemies on all sides to bring peace. Covert ops, assassinations, diplomatic duties and life-changing decisions fall upon the shoulders of players in this intense, gripping narrative. What are the fundamental ingredients to successful animated film storytelling? What pivotal role will animation play over the course of rapid technological advancements throughout the next decade and beyond? My presentation will include never before seen Kitaru footage, behind-the-scenes tips for aspiring filmmakers on how to Bring Your Vision to the Screen, an audience Q&A and free gifts for attendees. I'll see you there at the Festival theatre at 10:00am on Sunday, November 21st, 2010! Produced some new music recently along with finishing up script rewrites for Kitaru (a thousand pages and counting!). 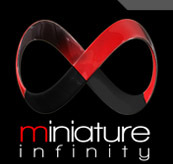 I'm really proud to be working with Scott and Damian at GSD Software on a joint-venture, 'Miniature Infinity'. Really happy with how the Alice-themed shoot I did in January for Couture Magazine turned out. 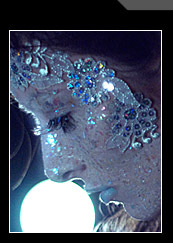 Our stylists, makeup artists, models and hairdressers were all phenomenally talented. It was amazing to collaborate musically with Lumidee and have pieces on hand from Jose Castro, Custo Barcelona, Silvia Tcherassi, and EVERYONE who contributed. We're looking at a follow-up with Ivan & Co as well, whose gorgeous jewelry frames the image seen here. Miniature Infinity is taking up most of my time these days. We're thrilled to announce production of our first mobile game release featuring the Kitaru brand. 2010 has been an exciting year so far and I can't wait to see what it has in store. My friends at O'Meara Sterling also have a new site up that's definitely worth a look. 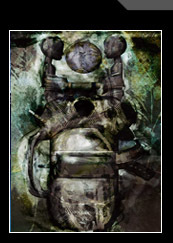 A print illustration is now available in the downloads section. The technologies being explored for Kitaru right now are extremely exciting, performance capture being just one area. 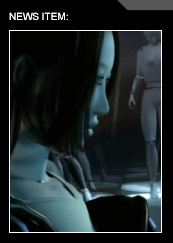 In addition to massive amounts of pre-production, much of the last year has been spent writing as well, discovering the heart of the characters and world to be presented. 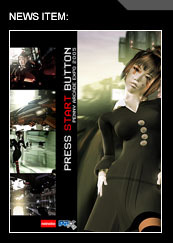 I suppose considering a short like Fragile Machine took 3 years (full time?!) it shouldn't be too surprising that this is an undertaking so wholly absorbing as to become, in the end, totally indescribable. Thankfully the entire movie is essentially about indescribable things, so these experiences have, in the end, been somehow instructive (in addition to maddening :-P ). I suppose just as experiences of spiritual transcendence from grief through redemption were necessary in order to understand and thus complete Fragile Machine, so too has a process of surrender been necessary to reach an understanding of the characters at the heart of Kitaru (Unfortunately it's never as easy as slapping a bunch of pretty pictures together, even though I always think it will be). Come to think of it, I believe this new work is both darker and far brighter than FM. In other news, an Aoineko musical performance of new material over the summer proved most enjoyable and a trip to the north country filled me with the natural awe necessary to realize my current work in its totality. Also won a Lightwave contest recently; many thanks to Newtek for that opportunity. Been reading Solzhenytzin lately, re-reading "A Tale of Two Cities" as well. We are proud to announce that our debut film, Fragile Machine, has now been re-released on DVD by our friends at Microcinema International. Our thanks go to Joel and Patrick for making this happen, and to everyone who has been waiting patiently to see the film. 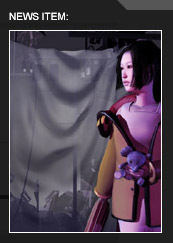 On rottentomatos he referred to it as "the best animated film of 2005". A nice compliment, indeed. Sorry to keep so quiet everyone. I *really* wish I could've kept all of you posted on what I've been up to the last 6 months, but it's too big and still a bit too soon. I was interviewed a few months back by a very special radio show called "Beyond the Ordinary". They were an interesting choice for us because rather than being focused on film, art, or music as most of the media who talk to us are, they are focused on metaphysics and spirituality. So, talking with them was a great deal of fun, and if you'd like to listen in, check it out here. Also, my apologies for the forums being down. We need a volunteer to administer them in order to keep the proper tone. 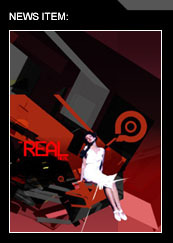 IdN, based out of Hong Kong, is synonymous with the cutting edge of Asian influences in digital art. 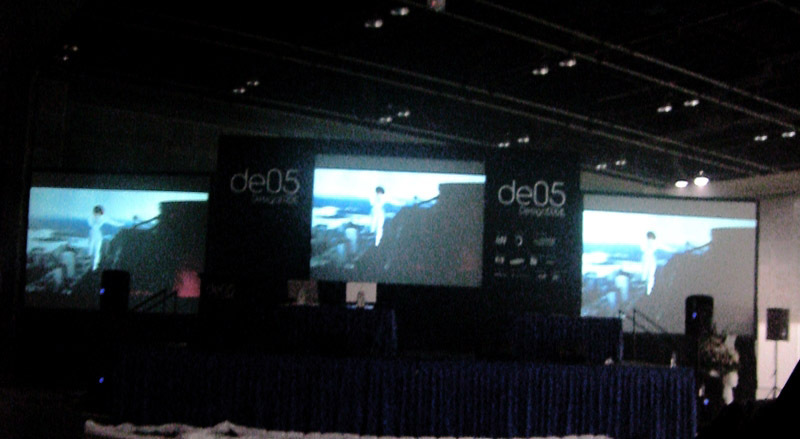 Thus we were honored to be among a select few international artists, including UNKLE, The Designer's Republic, Devilrobots, and Parisydneytokyo to have work represented at their DesignEdge 2005 Conference in Singapore. 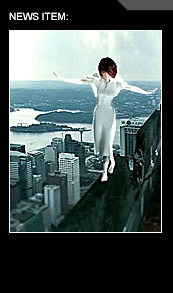 For mostly sentimental reasons we chose to revisit the idea of our first site, an angel in a white dress on a rooftop. Featuring a bit of the song "Sunlight Shift" from our forthcoming EP, the video was featured at DE05 in November and is now available for viewing here. Getting to do the IdN video was a nice treat. We've respected them for so long that it's nice to be included at such a great exhibition (Special thanks to Katharine at IdN!). We were pretty depressed at not being able to attend DesignEdge personally, but our plate is quite full with the album and pre-production work for our next film. I also had a blast in Ontario at WFAC. Festival Director Joseph Chen put on a great event, which also featured Eiko Tanaka and Marimi Sakurai of Studio4°C and Mike Nguyen (lead animator of The Iron Giant). Tanaka-san showed off their brilliant new film Mind Game and Mike lectured on core animation principles as only an animator of his caliber could. We are definitely looking forward to his film debut. Matt from Drawn.ca was there too with write-ups on Fragile Machine and more. We hope everyone is enjoying the holidays. Later this month there will be a special present for all of you right here at Aoineko.com. The Waterloo Festival for Animated Cinema begins Nov. 17 and will prominently feature Fragile Machine among its film selections. In addition, the festival organizers have arranged for our own Pilot S to attend. It will be his first appearance in the Great White North and he's bringing some special goods straight from Aoineko HQ, so all our fans in the Toronto area be sure to attend! I can't wait to meet some of you at WFAC, I'm sure it will be an event to remember. 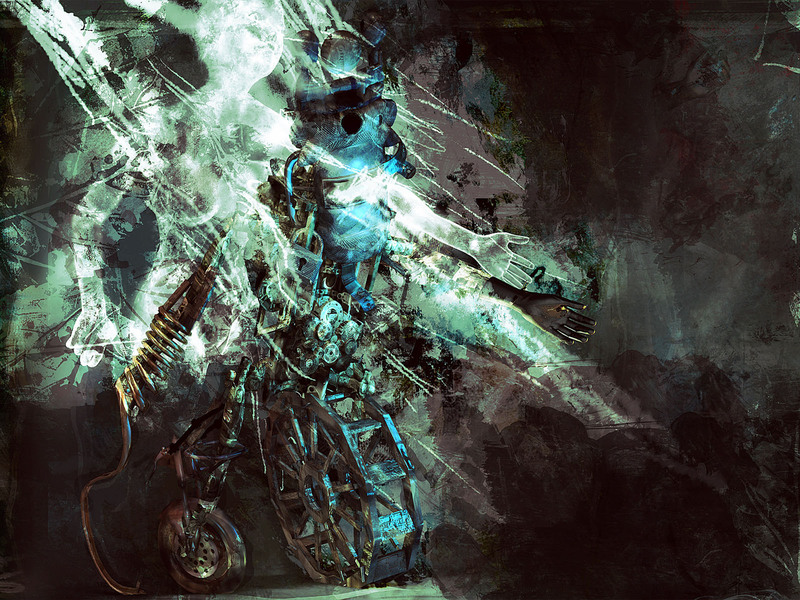 In other news the Fragile Machine First Edition DVDs are nearly sold out! If you are looking for one of these exclusive collectors' item DVDs you'll need to order it this week. We are currently preparing the Second Edition so we can keep the film in stock; more info on that will be forthcoming. MUSIC UPDATE! The first music EP is coming along very well. X, Op J and I have been slaving away feverishly on it and it will definitely be out by Christmas. 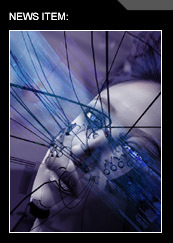 BTW Fragile Machine is also set for showings at the Anchorage International Film Festival. 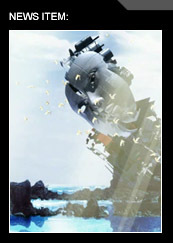 "For award-winning artists and musicians Aoineko, the decision to create a new short celebrating PAX 2005 was a natural. After all, the two share much in common. 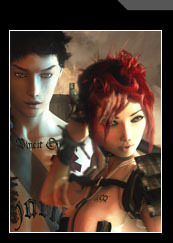 Both are small, independent groups creating their own work for a unique and intelligent audience, and both love videogames. 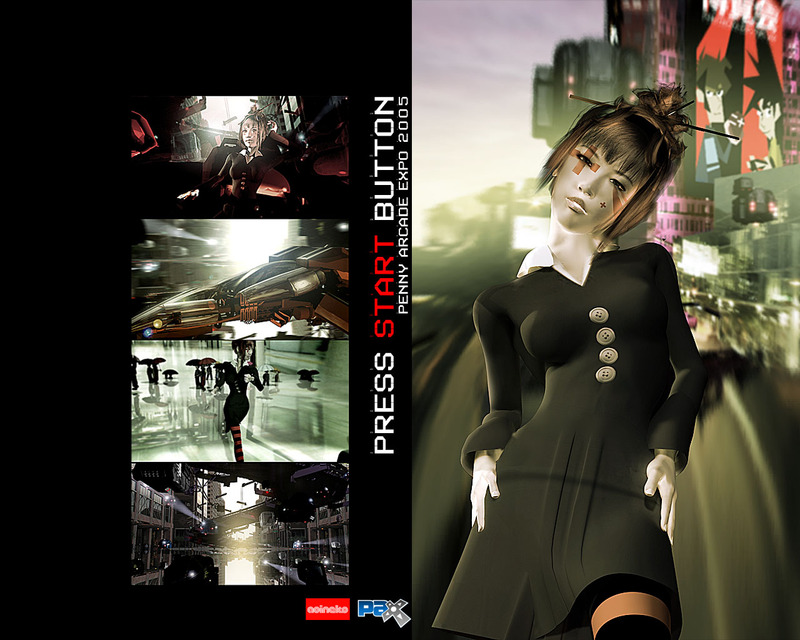 Therefore, Aoineko’s chosen topic for the film, a vision of its own dream game, seems especially perfect for this event. 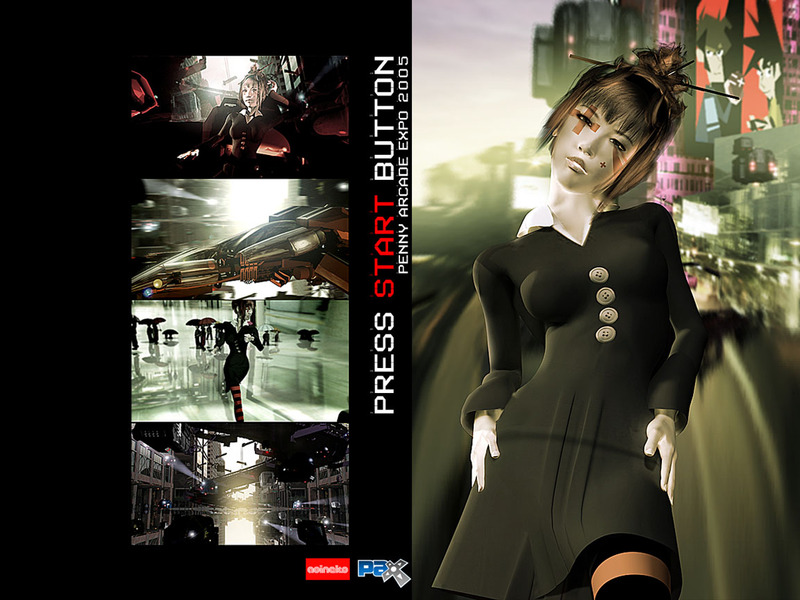 The film references videogames from every era, the archaic to the cutting-edge, and features a CG version of Aoineko vocalist X as its protagonist." We slept on floors + couches provided by the inimitable The People Now. Gratis members may note TPN frontman Turkish's lilting guitar on the last track of Fragile Machine EP One. And yes, I did have a hand in the making of their site. It was also fun to watch episodes of Sealab 2021 with them directly after hanging out with MC Chris (voice of Sealab's Hesh) + his friends at PAX. PAX itself was positively surreal. Some of my favorite moments were watching the DDR kids, seeing the final Tank round of the Omegathon, making some new friends, and chatting with talented fellow creators like Tycho and Gabe from PA and Burnie from Red vs. Blue. Of course things weren't perfect. Often it appeared that only the most ardent fans were seeking out PSB and really "getting it", but after I appropriated a hidef TV that was stationed behind us and started showing the FM trailer on loop, the situation got more comfortable. TEE HEE. So I guess I did feel like we were a bit out of place there, but it seems to me that art like ours can be appreciated in a lot of different ways, and reaching out to different audiences is really necessary in a world where the purveyors of traditional modern art don't have anything resembling a clue about what's really happening in the world. I suppose my ultimate point is this: the connection we make with real people at a place like that is a lot more profound than painting a giant canvas blue and charging $30k for it. And that pseudo-intellectual stereotype + the surrounding art "scene" is pretty damn omnipresent. There are a lot of successful modern artists I don't envy. I mean,money just doesn't mean anything if your work doesn't help people. Maybe I sound like I'm taking it too seriously, but that's just because for me art has always been a life-preserver, keeping my head above water. To answer a question here I got asked a lot at PAX, yes I did all the 8bit stuff in PSB and yes, it was incredibly fun to do so. Also, read quite a nice review of FM before I left for Seattle. Here's a link. Being flown to Paris and given the opportunity to create a sponsored work of art for the world-renowned designer Thierry Mugler was absolutely inspiring, and we hope the end result, Living Spaces, will inspire you as well. It was a long time coming, nearly a year in all, and is now available through Thierry Mugler's official site. 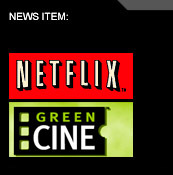 Online movie rental services Netflix and Greencine have both added Fragile Machine to their selections. Hope they go to good use. I am not expecting Netflix users to be particularly kind to the film, mind you, they gave WWFT's brilliant Finding Eutaw and North 2 stars. What the eff is that? Also, it might be fun to clear up a popular misconception on the internet about us. I have read on countless sites, even fellow indie animators Broken Saints that we are apparently rich beyond belief. I can assure you that is not the case. 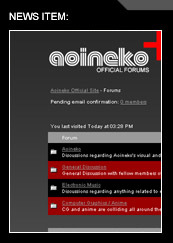 The Aoineko Official Forums will, with hope, become a place where intelligent net users discuss art, music, technology, and more with sensitivity and insight. Since the forums have just come online, it will be an experiment to see if they succeed or fail as a distinct community. We hope that you will join us in trying to make them a success. Aoineko are pleased to announce a free online film series based on Fragile Machine. 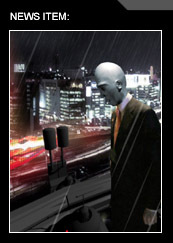 Fragile Machine: Oread serves as an introduction to the 34 minute Fragile Machine film, combining FM animation with new shots and music. 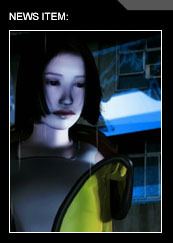 Viewers will experience Leda's life in the months leading to the events in FM. Check out the first two installments here. Had a bit of a nice vacation in Nashville this month, visiting the one and only Bureaucrat D. He is indeed the real power behind Aoineko, bandying about watching paint dry and conversing with tree men. I am not making this up. That is what the man does. How he manages to keep such a vastly overpaying job as Aoineko Interior Vice Commerce Assistance Executive Secretary is truly a mystery. Of course we've all completely lost it in our own ways. Just consider my earth shattering lust for power. Somewhere between the hiking, exploring, eating, and assorted games + movies, we found time to play two-front chess and do some drawings. Two front chess is playing two different chess games at the same time, and is quite fun because they generally end up having played out in completely different styles. I draw quite rarely, but was very happy with how this illustration turned out. Aoineko and AV label SOAC launch RE.CONT.XT Exhibition I this summer. 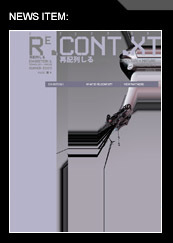 RE.CONT.XT is an overarching collection of technological wonder from a range of internationally respected artists. Design, animation, music, fashion, architecture, philosophy, and engineering will all be explored with a sharp focus on the next chapter of human evolution. More information will be forthcoming in the months ahead and you can be sure the RE.CONT.XT official site will keep you updated. So, our label SOAC has relaunched their site. You diehard fans may remember the lovable eggman Mr. Biji (That's Engrish for Mr. Business) from way back when. He's hanging out there, and sporting a hawaiian shirt + tie combo, no less. Now tell me you don't love that. We've put another music EP in Gratis, this one featuring some Fragile Machine tracks and one song off our first demo from a years back. Have you ever seen the film 32 Short Films About Glenn Gould? It's a big Aoineko favorite, but there's always been one scene I just never understood. 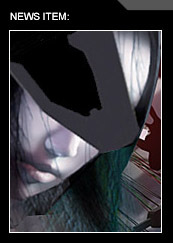 Another favorite of ours is songwriter Takako Minekawa, especially that music video for her song Picnic at Loose Rock. Harrison S. Fraker Jr., dean of the College of Environmental Design at UC Berkeley has said, "The Phoenix Library is one of the most important American buildings of the end of the 20th century." We couldn't agree more. Indeed, we were delighted to honor its 10th anniversary by producing the short film "Area of Temporary Refuge" in collaboration with Will Bruder Architects. 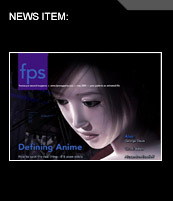 FPS Magazine sought 10 people to help them define anime. We were honored to be part of that group, and hope you find some insight in the answers. The others asked also had some very interesting ideas, and the issue makes for a fascinating read. We are proud to announce the launch of the official Fragile Machine website, featuring a new trailer, behind-the-scenes info, and new art produced for the film's DVD release. The Fragile Machine First Edition DVD is now available. 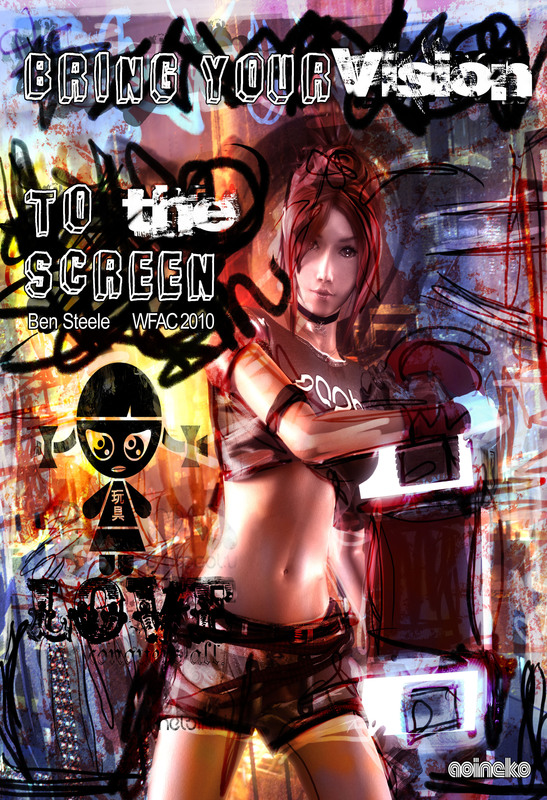 Featuring six remarkable chapters, it merges advanced computer animation and music in a wholly new method of postmodern storytelling. Woven into the film's hypnotic narrative are fractured and nonlinear examinations of humanity's roots and future. 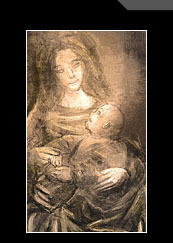 The film has been shown at select art festivals and museums around the world and has recently been the recipient of the �Directors' Choice: Best Animated Film Award� at Sedona International. 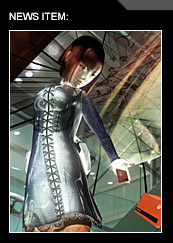 Earlier awards include honors from Canon, Acer, Rockstar Games, and BML Art, and previews at the Aoyama Spiral in Tokyo and the Dream Sphere in Taipei. Even before it's official release Fragile Machine has been getting some nice attention, having already been honored by the Sedona International Film Festival and the DIY Fest in LA. Anybody in Sedona in March come check out the showing of FM. We'll be there and happy to chat. It was our pleasure this past weekend to attend the Sedona International Film Festival. It must be said that it was a delight. We were able to meet a great many amazing and talented people. Directors from all over the world had submitted their material and it was truly a pleasure meeting so many of them. We were also able to watch a great many people laugh, cry, and even enjoy our film. Sadly though, we were too busy to attend all the films we had wanted to see. For, the festival directors infused an intense amount of activity into the tiny resort town Sedona. At one point it was too difficult for Pilot S to even eat for most of the day. It was actually quite a sight, watching him continue to function throughout the day: meeting, greeting, chatting, and still walking. I think I got hunger pains from just watching him. The trip's highlight was the director's work shop. Normally these events are quite drab. It turned out that the directors that were invited were sensitive to this; every one of the guest speakers gave their hearts to explain their theories on filmmaking. I would like to thank Patrick Schweiss, Jim Colletti, Dr. Sheila Jackman, Linda K. Smith, and everyone else with the SIFF for all their hard work in creating such an amazing event. It truly was something special. If any of you get a chance to head down to Arizona in the spring next year, I would seriously suggest checking it out. Upcoming releases by Aoineko include the hugely anticipated debut CG film "Fragile Machine" on DVD and the "Music for Living Spaces" CD. The wait for Fragile Machine is almost over as the film finally comes to DVD February 20! With the kind help of independent music seller stinkweeds Aoineko has also readied an online shop to launch with the DVD release. In answer to the numerous album release date Qs, Aoineko has confirmed a tentative late April release date for MFLS. BUSY BUSY BUSY. Along with the massive crunch time that finally finished Fragile Machine we were wrapt in experimention with some new composition techniques. 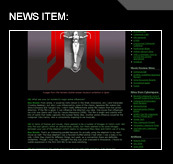 As a result there's been little time to update the site. Finally got to take a break today, so I thought I'd share some love with you all. Got a chance to see Samurai Fiction. Word to the Hiroyuki Nakano. Here's a link to a page by him proving he's the coolest guy in the world. I also found out he was a judge at CDCC so I almost got to meet him. Damn. Every time I get bored with electronic music I go back to BoC and FSOL. And besides BoC's absolutely lovely melodies I think one of the main reasons is the sound layering elements they take care to include. I like music with a setting and a story. I like music that takes me somewhere. 95% of electronic music fails to do that. Most of it's really dry and lifeless. To wit. So remember kids, when you make those songs with the fat beats, don't forget the heart. In other news augmented rat brains are now flying jets. About damn time. And lastly, the fine folks at Pixelsurgeon took the time to get inside our heads. We talked a bit about Fragile Machine as well as obligatory influences, techniques Qs, etc. If you want to find out who our favorite artists and film directors are or if you just have 10 minutes to waste check it out. 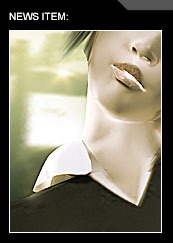 Aoineko's first solo exhibition in the US, January 14 and 15, 2005, has come and gone. Thanks so much to everyone who was able to come. We loved meeting all of you and are grateful for your support. For those who weren't able to attend, here's what you missed: an exclusive showing of Fragile Machine, along with new music, almost 2 dozen art prints on display, and interactive installations. If you'd like to see an Aoineko event in your town drop us a line! 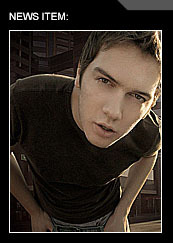 More 2005 US dates TBA. We’ve released the trailer to our upcoming cg film “Fragile Machine.” Fragile Machine is an avante-garde excursion into what we've dubbed, "futuristic humanism." It is a mini-epic composed of nine parts featuring animation and an original score composed by aoineko covering diverse stylistic ground. Think of a cross between "Fantasia" and "Kurosawa no Yume" in a dying metropolis and you'll be almost there. 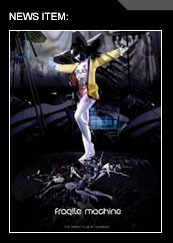 The film will be released on DVD in early 2005. Select showings worldwide are beginning in January with exhibitions and showings at US galleries.